H.H. Sheikh Ahmed bin Saeed Al Maktoum, Chairman and Chief Executive of Emirates Airline and Group, commented on completion of the unique Expo 2020 liveries: "As we begin to gear up for Expo 2020 Dubai, we are proactively tapping into the power of Emirates’ network to spread awareness and capture the world’s attention around the themes of this global event with our mobility, opportunity and sustainability liveries. Connectivity is the lynchpin that brings together new ideas, fosters global dialogue, and helps us navigate through change. Emirates will play a key role in opening up opportunities for visitors to experience this truly global event, as it offers non-stop flights to Dubai from many of the Expo participating countries, and 70% of the 25 million people targeted to visit Expo 2020 are expected to utilise air transport." Reem bint Ibrahim Al Hashemy, Minister of State for International Cooperation, and Director-General of Dubai Expo 2020 Bureau, said: "With less than a year and half left until Expo 2020 opens its doors and welcome millions of visitors from around the world, we are very proud that our Premier Partner, Emirates Airline, is carrying our message around world through its incredible destination network." 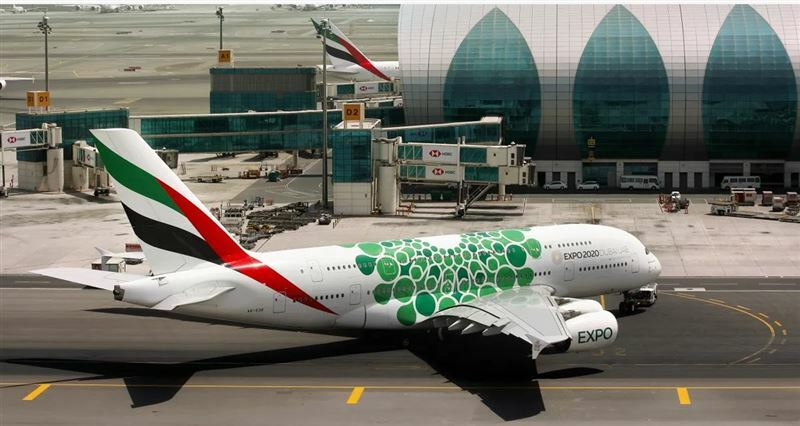 "Emirates’ aircraft carry more than just the colours of our sub-themes of Sustainability, Opportunity, and Mobility. They also carry the UAE's message of the power of international cooperation to chart a better future for all, exemplified by an Expo that unites 190 countries and millions of visitors here in Dubai." 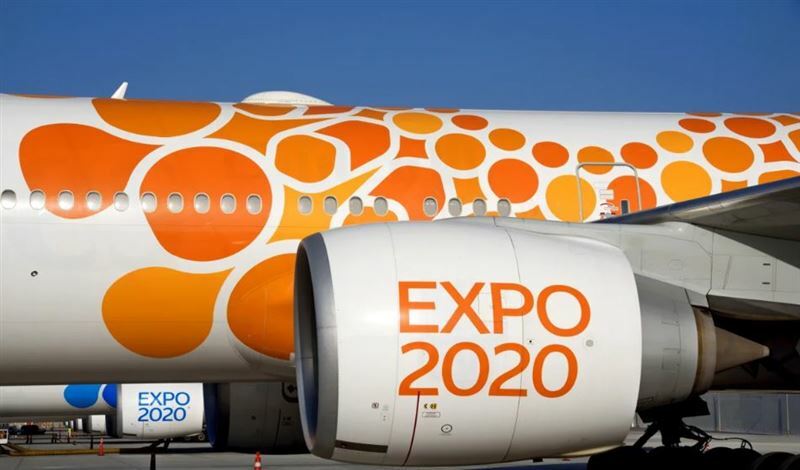 The aircraft decals are comprised of circles and hoops encircling a ring, in three distinct colours reflecting the sub-themes of Expo 2020 Dubai – amber tinged orange for ‘opportunity’, emerald green for ‘sustainability’ and cerulean blue for ‘mobility’. 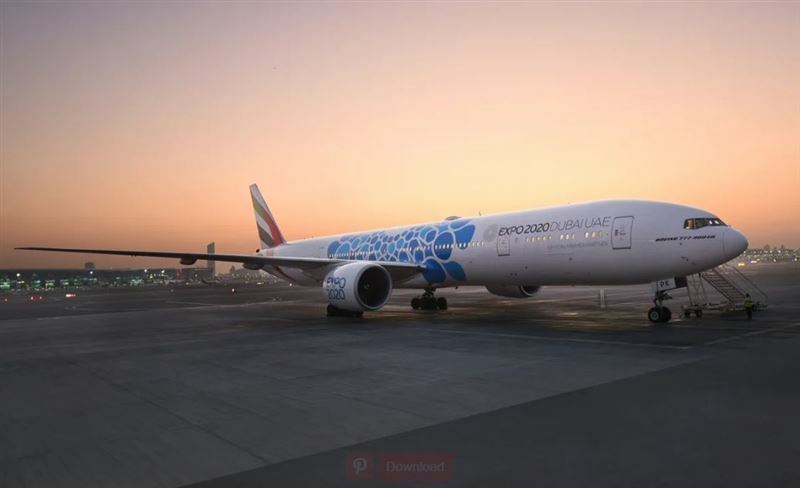 The Expo 2020 Dubai decals are also among the largest to be applied on the Emirates Boeing 777 and Airbus A380 fuselages, in addition to covering each aircraft type’s engine cowls.